Located along Tioga Road in the heart of Yosemite high country north of Yosemite Valley, Olmsted Point is one of the more prominent roadside pullovers and viewpoints. Named after Frederick Olmsted Sr. and Jr. (both landscape architects and heroes of park management and conservation), this is a worthy spot to get out of your car and take in the views of the surrounding area. Olmsted Point offers a wonderful straight-shot view down Tenaya Canyon with Clouds Rest high in the foreground and Half Dome far in the distance. A short 10-minute hike takes you to a little viewpoint that gives you an even better view. 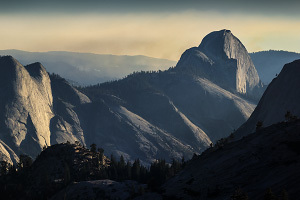 The 48-mile stretch of Tioga Road between Big Oak Flat Road and the Tioga Pass entrance is a wonderful drive through Yosemite's beautiful high country with many outstanding roadside landmarks, including Tuolumne Meadows, Tenaya Lake, and Olmsted Point. Olmsted Point is easily the most stunning viewpoint along Tioga Road and is the only spot close to the road that allows you to peer far off into the distance and see Yosemite Valley and Half Dome at an angle that shows off its complex features. 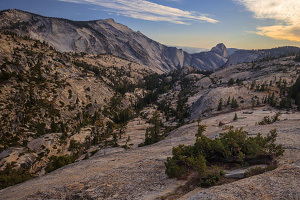 Clouds Rest, which stands 1000 feet higher than Half Dome, can also be seen towering above Tenaya Canyon. While you can get a great view from the parking lot, walk the steps down and follow the short little trail to the viewpoint at the front of the small dome formation to the south. This spot gives you a less obstructed view and you can also wander to the top of the small dome to get some great views to the northeast. 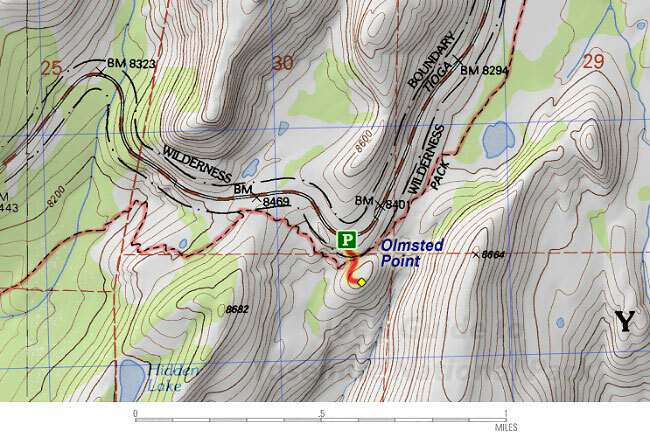 There are also many opportunities for more random exploration near Olmsted Point, including the ridgeline to the west and the small dome on the north side of the road. A note on seasons: Tioga Road typically opens in May or June (depending on snowpack that year) and is typically open until mid November, although there can be temporary closures for early winter storms in October. A roadside spot with a killer view and a short walk to an even better view... Absolutely! If you're passing by on Tioga Road, get out of your car and enjoy a little stroll at Olmsted Point!